The first step is to display the bill status table for your specific bill online. If you are looking at a session law online, use the “Resources” column on the right and select the "History and Authors" link which will open the bill status table. Select either Search House Bills (HF) or Search Senate Bills (SF). Year: The bill search page defaults to the current session. To search for previous sessions, change the year in the Session box. Bill Number: Enter your HF or SF number in the Search by Bill Numbers box and click GO. On the Search Results screen, click on the bill number in the Bill Status column. That displays the bill status table page. 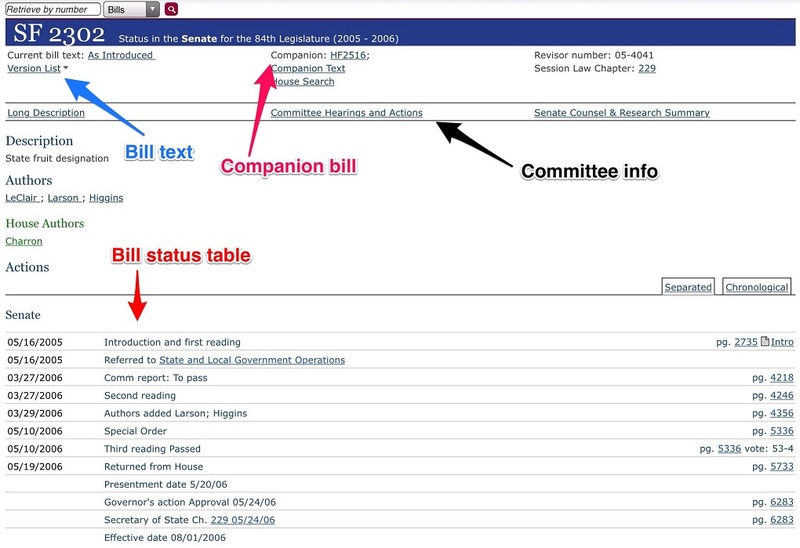 The bill status table records actions on the bill and includes the bill text, information on authors, committees, floor actions, and a link to companion bill information. The links to committees often contain audio or video links. However, audio or video of floor debates will not be linked to the bill status table. Below the screenshot you will find information about how to use the bill status table as well as how to research the many aspects of a bill's legislative history. There is a link at the top center of the Bill Status Table titled "Committee Hearings and Actions" for Senate bills or "Further Committee Actions" for House bills. It links you directly to minutes and audio or video of committee hearings (at least for recent years). If there are no links, then you will find committee information in the bill status table. For more recent years, you may be able to click on the committee name to view minutes and access audio or video recordings of committee hearings. If committee hearing information is not online, the important information to take note of for each committee is the committee name, the date the bill was referred to the committee, and the committee report date. The next step is to find out the exact hearing dates(s). This is done by using the committee minute books. In addition to audio, minutes are the primary records of committee actions. Each standing committee in the Senate and House is required to keep minutes of every committee hearing. Committee minute books include an index of all bills referred to a committee during the legislative biennium. The index records the date(s) a bill was heard in the committee or in divisions or subcommittees of the parent committee. The minutes provide a record of the committee hearings including the agenda, members present, names of those testifying, and a record of actions and decisions. They may also include copies of bills and amendments or handouts distributed during a hearing. The minutes do not include hearing transcripts. The amount of detail provided by committee minutes varies among committees and from year to year. Even when minutes lack detail, they can provide clues to why legislation was passed. After committee hearings, a bill is forwarded to the full body for consideration during a floor session in the House or Senate chamber. When looking at the bill status table for your bill, floor actions are generally recorded after all of the committee hearings. To better understand what is happening, click on the Journal Page link at the end of each row. Make a note of the dates of Senate and House floor actions. Floor Debates for this time period will often (but not always) have audio online. There are no links directly to the audio or video from the Bill Status Table. Use the links below to navigate to the audio or video. 1991-2003 — NOTE: Through mid-2018, there will be limited access to House and Senate audio tapes from the 1991-2003 legislative sessions. The tapes are being digitized as part of a project to provide permanent online access. Digital files of tapes may be available for a fee during this project. For more information, contact a librarian. 2004-present — Online: complete audio coverage; selected video coverage. The original 2004 cassettes were transferred to digital files in 2010 through a grant from the Minnesota Arts and Cultural Heritage Fund. When a bill is introduced in either the Senate or the House, there is usually (but not always) a similar bill, known as a companion bill, introduced in the other body. They have different numbers. If there is a companion bill, there is a link to it at the top of the bill status table. Only one of those bills can ultimately pass the legislature. If one of the companion bills is passed by the full Senate or House, that bill (SF or HF) is sent to the other body. At that point, the second body stops using its original bill and starts using the companion bill. Make sure you record all relevant actions and dates for the companion bill as well. Conference committees are different than regular standing committees. They are temporary committees that are created to examine differences between Senate and House versions of a particular bill. They include both Senate and House members. Audio or video is available for conference committees in recent years. However, if there is no record of a conference committee on the website, make a note of the dates. Librarians can help you determine if any minutes or recordings exist. You will use print records (Journals and committee minute books) to find the legislative history on bills prior to 1995. For bills 1991-present, audio recordings of committee hearings may be available. Prior to 1991, audio is not available. The Minnesota Senate and House each prepare a record of actions on all bills introduced during each 2-year (biennial) session. These are known as the Journal of the Senate and the Journal of the House. If you have a House File (HF) start with the House Journal; if you have a Senate File (SF) start with the Senate Journal. Find the Journals for the correct year and look at the index volume. Look up your bill number in the index. Tip! Definitions of the terms used in the Journals can be found in the Glossary for the Numerical Index of the House and Senate Journals. For further help, see: Using the House and Senate Journals (PDF). The numbers in the columns are journal page numbers. On those pages are records of introduction, referral to committee, floor debates, and possibly conference committee actions. Look up each page number listed. The page number in the "First Reading and Reference" column refers to the page where the bill was introduced and referred to the first committee. Turn to that page and note which committee the bill was referred to and the referral date (at the top of the page). Additional information on committee actions is usually in the "Other Proceedings." Be sure to note the dates of all committee referrals and committee reports. With those dates, you have a general idea of when the committee hearings occurred. Look up the remaining page numbers and note all relevant actions and the dates they occurred. Those additional actions may include floor session debates, votes, and conference committee actions. If recordings of floor sessions are available, they are accessed by date. Using the committee names and the referral and report dates you found in the Journals, the next step is to find out the exact hearing date(s). With the help of a librarian, find the correct committee books. In the first volume, there is often an index of all bills referred to the committee during the legislative biennium. The index records the date(s) a bill was heard in the committee or in divisions or subcommittees of the parent committee. Write down the dates of your bill's committee hearings; be sure to note if the hearing was in a division or subcommittee. Look through the minutes of the meeting(s) where your bill was discussed. Each standing committee in the Senate and House is required to keep minutes of every committee hearing. The minutes provide a record of committee meetings including the agenda, members present, names of those testifying, and a record of actions and decisions. The minutes do not include meeting transcripts. Even when minutes lack detail, they can provide clues to why legislation was passed. The minute books may also include bills and amendments, bill summaries, reports, brochures, handouts, or copies of individuals' testimonies. The minutes may indicate that the bill was based on legislation passed in another state, leading to further avenues for research. The minutes may indicate that a bill before the committee was the product of a task force, commission, or work group set up to study the issue. The report might be appended to the minutes or identified by a search of the library catalogs of the Legislative Reference Library or the Minnesota Historical Society. Librarians at both locations can help you search their collections. After committee hearings, a bill is forwarded to the full body for consideration during a floor session in the House or Senate chamber. Use the bill index in the Journal to find the page numbers for floor actions and debates. Major actions on the floor are recorded in the Journals. Floor Debates for 1991-1995 will often have an audio record in the Minnesota Historical Society Library. More details about audio availability are below. Through mid-2018, there will be limited access to House and Senate audio tapes from the 1991-2003 legislative sessions. The tapes are being digitized as part of a project to provide permanent online access. Digital files of tapes may be available for a fee during this project. For more information, contact a librarian. The Journals are the primary records of floor debates and the minutes are the primary records of committee actions. The records in the Journals or committee minute books may lack detail, so further research may be needed to gain a full picture of the proceedings. See the Additional Research Materials section for ideas on how to use secondary sources in the legislative history research process. The companion bill is a similar bill introduced in the other body. The index volume has a section called "Companion Numbers/Bills." Look up your bill number on that table to see if a companion bill exists. If so, write down that number. Go to the Journal of the other body and go through the same process of recording relevant actions on that bill. Only one of those companion bills can ultimately pass the legislature. If one of the companion bills is passed by the full Senate or House, that bill (SF or HF) is sent to the other body. At that point, the second body stops using its original bill and starts using the companion bill. In order to track the actions of a companion bill sent to the other body, use the Journal index. In the Senate Journals there is a section in the index called, "Senate Record of House Bills." In the House Journal index, it's called the "Numerical Index of Senate Bills Transmitted to the House." Again, record all relevant actions and dates. If there is a conference committee, note both the date that the conference committee was created and the date of the conference committee report. Conference committees are different than regular standing committees. They are temporary committees that are created to examine differences between Senate and House versions of a particular bill. They include both Senate and House members. Their task is to recommend a compromise-version of the bills that both bodies can agree on. Staff at the Legislative Library or the Minnesota Historical Society can help you determine if minutes or recordings exist.